From November 22nd, 2007 - 2012, all iron ore mining in the state of Goa, India was declared fully ILLEGAL by the Supreme Court. As a result, the future generations of Goa have been looted of their rightful inheritance, and Goans have had to bear the massive impacts of years of unregulated mining on their land and society. This video highlights the need to immediately cancel the state government's immoral mining lease renewals, as the first step towards justice. This video provides an in-depth exploration of what the Goenchi Mati Movement is, and the solutions it proposes to address widespread mining corruption and theft of resources in Goa, India. The mining system that was in place resulted in massive loss in the value of our minerals - Goenchi Mati has proposed a solution for fair mining, where we preserve the inheritance for our children. Ore Chor! 144 dubbed in the native Konkani language of Goa. 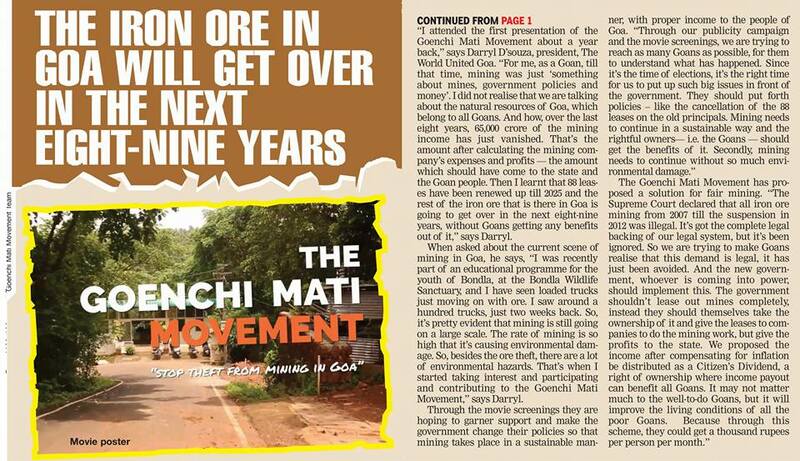 The Goenchi Mati Movement dubbed in the native Konkani language of Goa. We encourage sharing this work to grow social awareness, and inspire action.